Australian luxury boatbuilder Maritimo is branching out to woo a younger market with its free spirited and refined 550 Offshore Convertible. Maritimo's Cruising Flybridge class features obliging walkaround decks, comfortably enclosed flybridges, and stairwells instead of ladders that you otherwise need to climb. Such conveniences appeal to those with the wherewithal – usually retirees – to buy a big boat, and motor off into the tropical sunset to thaw out in winter. But not content with that market, Maritimo is now pitching its boats at a younger audience. The first of the dashing new-breed Maritimos, the 550 Offshore Convertible that debuted at the Sydney International Boat Show, is a more contemporary and (in my eyes at least) much prettier boat than its Cruising Flybridge cousins. The 550 has a really sweet sheerline and smart superstructure with clean lines and none of the appendages of the Cruiser Flybridge range that, I reckon, hark back to the old Riviera 46 Passagemaker. With huge integral GRP tankage – 3600 litres of fuel forward and a further 1800 litres back aft – plus 800 litres of water (which might be moved out of the engine room and back aft), there is little reason to rush back home. Meantime, on the inside, during those long-range live aboard fishing and cruising trips, there's a more vibrant and communal layout. Gone are the bulwarks, the pinched saloon, small aft galley and the questionable sliding saloon doors. In their place are a broader living area with improved relaxation factor and, the star attraction, a massive amidships galley with built-in Miele cappuccino machine and more. There's less creative air space and more practical living space on the 550 Offshore Convertible. As such, this is a boat that, for Yours Truly who enjoys nothing more than living aboard for a week, I could relate to, especially when you put the throttles down and hit a blindingly fast 36 knots. Tipping the scales at 27,000kg (dry) sans tower, the 550 is a comparatively light boat. The Riviera 56 with the same engines weighs 30,000kg. Depending on your point of view, the extra weight is either a blessing or a ball-and-chain in a battlewagon. Certainly, for cruising in fair weather, an easily driven and light displacement boat wins out. As most cruising folk with time on their hands tend to wait for windows of fair weather and following seas, a light ship might save them fuel. Based on the Maritimo 52 hull, the 550 is made from solid fibreglass below the waterline with cored decks above it. There is a watertight collision bulkhead, freestanding internal bulkheads formed around lightweight aluminium honeycomb coring, and a watertight engine room which is especially roomy, thanks, in part, to a separate aft machinery space. You get walk-in engine access from the cockpit and, heaven forbid, should the worst eventuate, it is possible to remove floor panels to crane out an engine. Between the big straight-six Cats, checkerplate flooring runs to the forward bulkhead with the Racor fuel filters and coolant bottles. The boat had an optional oil-change system and new double-baffled engine-vent system with fan-assisted ventilation. I also noted decent access to the 17.5kW generator, a largely 24V DC electrical system, and an inverter as standard. Wiring schematics are supplied with the boat, say the specs. There’s also provision to fit a watermaker, plus additional 2000W inverter, optional (but must have) air-con to the flybridge, 200 to 350kg davit and dinghy to the foredeck, and other cruising conveniences. The Maritimo systems seem simple enough, user-friendly and accessible to me. And, with three-inch shafts and ZF gearboxes, you should be able to drive the boat back hard. Despite no bulkwarks, all but the infirm will find the 550 Offshore Convertible easy to get around. Moulded toerails and non-skid (the difficult-to-clean type) handrails and a bowrail assist with your footing. The anchoring system is heavy-duty including a Muir rope/chain windlass, double rope/chain lockers, saltwater washdown and moulded bowsprit. There is heavy-duty and easily accessible deck gear on the foredeck, but the cockpit has been kept intentionally snag-free, with hawse-pipes and below-deck cleats, as well as moulded, rounded GRP coamings that feel almost as nice to lean into as padded coamings. As always, all the catches are flush. I'm not sure about the high-gloss teak covering boards – a near $10,000 option that have covers – as they look high maintenance, but you could specify raw teak if you want. Other options include a boarding platform if you like to cruise, (small) stainless steel barbie or central livebait tank, in-floor kill boxes, various rear awnings and the demo boat had a continuous rated high-pressure 24V deck wash. If fishing is your bent, you can customise with a rigging centre and bigger bait freezers or brine tanks, fighting chair, outriggers and more. With an inward-sloping and rounded transom the boat displaces water rather than shipping it when reversing. 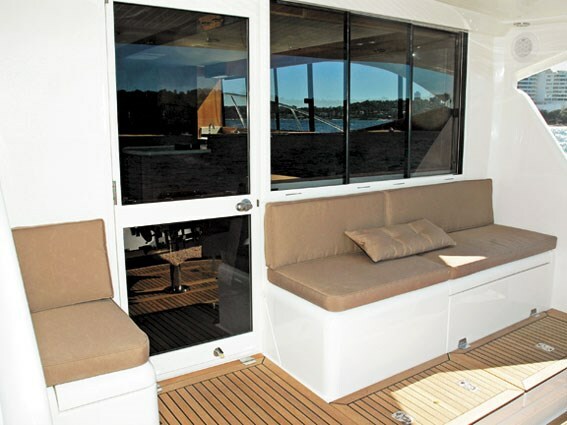 The self-draining decks appeared fast and functional, and there was a two-stage outward-opening marlin door. Alternatively, you could fit a table, chairs and big awning to the cockpit and do lunch on deck. All 550s have built-in seating for three plus one on an outdoor mezzanine level, under the flybridge overhang... pleasantly shaded and, thus, these are the best seats in the boat. Under the cockpit seats, or before them, you'll find built-in eutectic fridge/freezer space, iceboxes or rope storage or bait boxes. The demo boat was yet to be fitted with rodholders, which presumably will be through-bolted, plus it needed gaff and tag-pole storage. 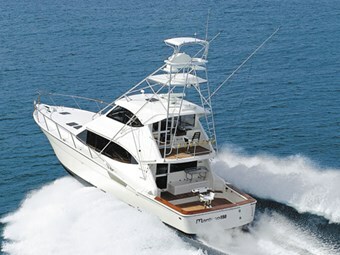 But as much as the fishing intent is obviously there, the Offshore Convertible is also a crowd pleaser and social boat. Hence it's Convertible designation. As ever, Maritimo provides an internal stairwell to the flybridge that's traced by a grab rail on the starboard side only. I would like to see some kind of retaining device around the stairwell opening in the bridge to prevent gear like cameras falling through. Enclosed, and with the optional air-con, opening windows and hatches, you can dial the climate control up top. Though the windows were lashed by spray, wipers took care of it. And, unlike some Maritimos I have been on, the rocker switches are in arm's reach of the helm so you don't have to lean forward or leave the seat. The new low-glare dash is home to a spread of electronics including engine-monitoring for the Cats, Furuno Navnet system with big colour twin screens, 3kW depth sounder, Simrad autopilot, bowthruster, chain counter, and more. 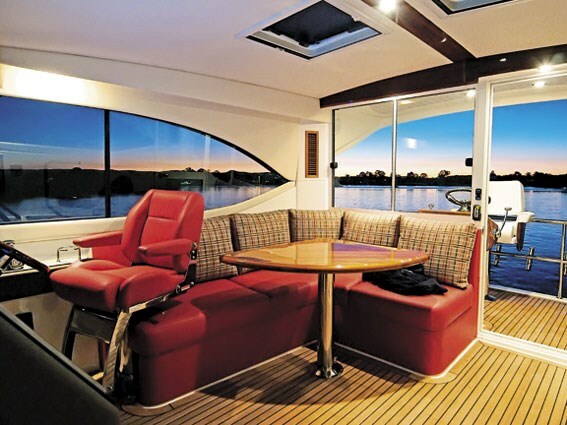 There is a single Navigator high-backed helm seat – a second seat is a listed option and desirable for cruising couples – plus a two-person crew bench alongside and an L-shaped lounge behind that's big enough for four people. With a teak table supplied, at a calm anchorage, you could lunch up here. It's also a social layout for cruising with the clan. There's a fridge in the bridge, but I would like to see the dinette convert to a big double bed for the captain when anchored on a bad night or for the crew when off watch and passage making. From the aft outdoor helm station you get to enjoy eagle-eye views of the cockpit. 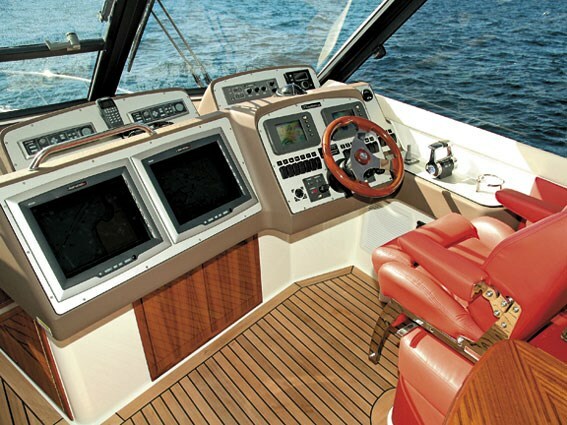 The teak steering pod has an Edson wheel, split throttles a la Palm Beach style, and the ladder-back helm chair doesn't hinder the sight lines. With electronic ZG gearboxes with trolling mode, you can idle around as fast or as slow as your baits, lures or driving skills require. The Amtico (industrial-strength mock timber) flooring indoors will be easier to maintain than carpet, though eventually it still needs resurfacing. Headroom is a highpoint at two metres to ceiling liner, and there's a nice sense of space without too much open-planned air. Abundant windows really bring the outdoors inside and it will be a great saloon in which to spend time at anchor. Seating makes the most of the views and comes by way of a six-seater starboard L-shaped lounge around a dinette that’s big enough to double as a daybed. A second L-shaped lounge is amidships to port, opposite the galley that, with a folding dinette, makes a good breakfast setting. The gargantuan flat-screen television built-in behind the windscreen is best viewed from the aft lounge. The wet bar and massive tackle locker are alongside the stairwell to the bridge. All the joinery here and throughout the boat was high-gloss light beech. There is red leather upholstery in the bridge, but mocha leather in the saloon with tweed panels. Different. And not so contemporary. But the galley is the centre of attention and its enormity will sate the gourmet. Side-opening windows and an extractor fan give fresh air and ventilation, there are huge Corian counters, and a nice spread of cupboards and filtered drinking water. However, in the past the catches have been, from talking with at least one Maritimo owner, prone to letting go and dumping cupboard and/or fridge contents onto the floor. You have to love the spread of stainless steel European appliances: dish-drawer dishwasher, decent convection microwave oven, four-burner Ceran cooktop (sans potholders), domestic-sized fridge/freezer/icemaker (serious cruising buffs will need more freezer space), and cappuccino machine. The washer/dryer was located under the cooktop in the galley, but in my opinion it would be better in the engine room. Cupboard space is at a premium. Like most Maritimos, the accommodation spans three cabins and two heads. In my opinion, the stateroom is to port – far removed from the not-inconsiderable chine action – with a double island bed, big clothes storage 'wardrobe' under the mattress, and en suite with a big shower and excellent Tecma switchable fresh/saltwater head. Headroom appears to be improved in the heads, too. There are bunks to starboard, in a transverse arrangement, along with storage cupboards, so the cabin would make a decent dressing room. Along with the double island berth in the bow, with separate TV, it shares a communal head. It has another big shower, Tecma loo and one of those in-vogue floating glass washbasins. Fittingly, performance of the 550 Offshore Convertible is spirited and youthful rather than staid and steady. Fitted with (upgraded) twin Caterpillar 1015hp C18 diesel motors (700hp C12 Cats are standard), the demo boat hit an impressive 36 knots top speed at 2330rpm with 95 per cent engine load. So, it had scope to carry its impending tower. Moreover, the boat cruised in the groove at a sprightly 30 knots at just 1960rpm without much engine load at all, while burning 270 litre/hr on both engines. This equates to a 540nm-plus fast cruising range, leaving 10 per cent of the fuel in reserve. And, with an air-conditioned flybridge, you don’t have to worry about the spray as you reel in the sea miles. But should conditions not permit such speeds, it can still be driven at a more sedate clip without feeling like wallowing. Like the Maritimos before it, the 550 is based on a slippery variable-deadrise hull that, together with low seven to eight-degree shaft angles and a moderate 27-tonne displacement, is eager to get out and run level on top of the water. It’s said the boat does zero to 30 knots in less than 10 seconds. At 1740rpm, the 550 Offshore Convertible held 25 knots for 225 litre/hr consumption (only 25 litre/hr less in total than cruising at 30 knots), while at lesser speeds it seemed increasingly wet. Maximum continuous revs of about 2100rpm produce a 33-knot fast cruise, but I came away thinking you'll only be able to do that in fair conditions. The boat's flat run aft, curved and angled transom, and well-spaced engines also make it back up really well. With bow and (optional) sternthrusters, plus an aft station on the flybridge, the sight lines are great for docking and fishing. And, as Maritimo knows, there's no better place on the 550 Offshore Convertible for cruising the coast than inside that enclosed air-conditioned flybridge. Add big engines for bang and European appliances for wow, and you're really coveting attention from the next generation.